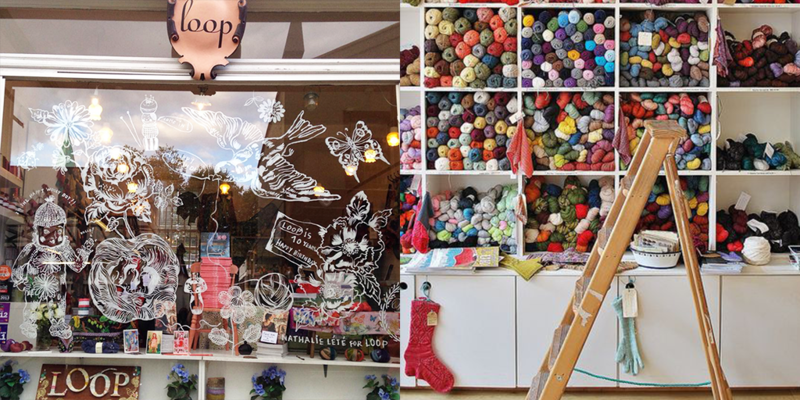 Sponsor: Loop is London’s leading local yarn shop, created by Susan Cropper in 2005, with the intention to bring the joy of colour, texture and design to the local fibre community. The shop itself is a warm, friendly place…full of inspiration and charisma, and you can see the care Susan has taken to create an inviting environment where folks can find the yarns they love and learn from the masters of their crafts…including Juju Vail, Jane Lithgow, Stephen West, Helene Magnusson, and Melanie Berg to name just a few. This Fall Loop celebrated their 10th anniversary, and to celebrate they released their newest book aptly named, ’10’…featuring twelve gorgeous patterns from designers Meghan Fernandes, Stephen West, Rachel Atkinson, Paulina Popiolek, Donna Higgins, Kristen Kapur, Ysolha Teague, Juju Vail, Tif Fussell, Claire Montgomerie and today’s guest, Pam Allen. I’m a big fan of Susan’s eye for composition, with each pattern being beautifully photographed and knit in a color dyed just for Loop. The Meandering Shawl by Stephen West is on my list to make this Winter. 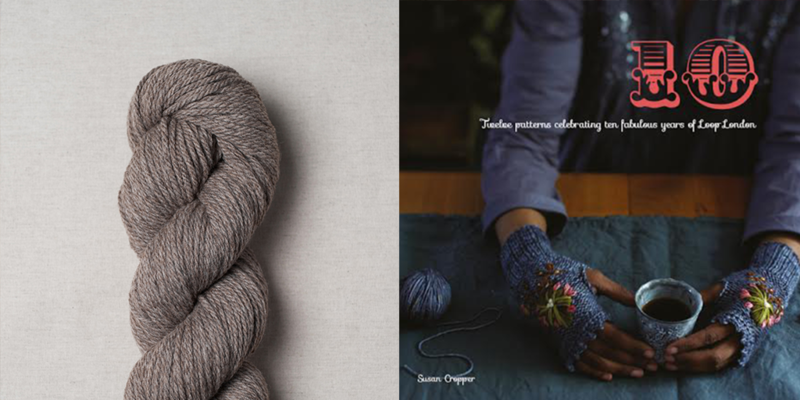 You can find the book at Loop, their shop online and at a handful of lovely local yarn shops. Loop has an extensive online shop in addition to their cozy London shop in Islington. Make sure to visit Loop in person if you’re nearby or just passing through, and online at loopknitting.com and on Instagram @looplondonloves. 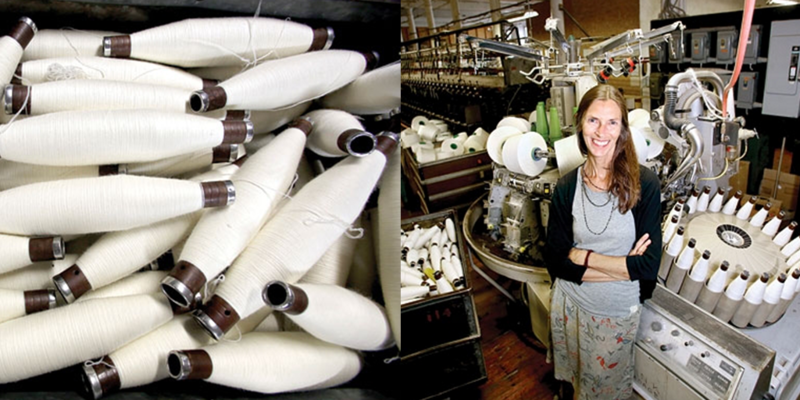 Fiber folk: There are a handful of special soul’s in this fiber industry, that have laid the groundwork and forged paths for what it is today and what it will become…having been a great influence on so many fiber folks. Pam Allen is one of these people. 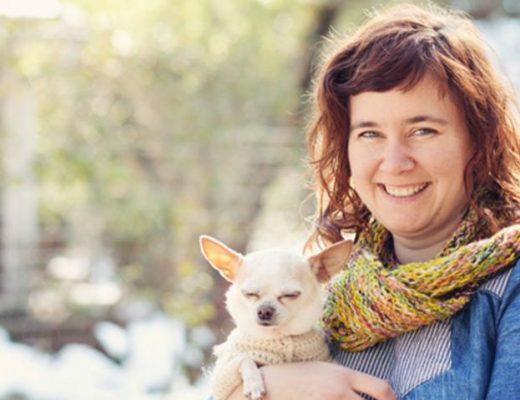 From motherhood and design, nursing school to Interweave knits, Classic Elite and now Quince and Co…Pam’s fiber journey is an inspiring one. When I first began talking with Pam, she started out by telling me that what she hoped to share was her personal journey…and honestly, that’s exactly what I hoped she would say. 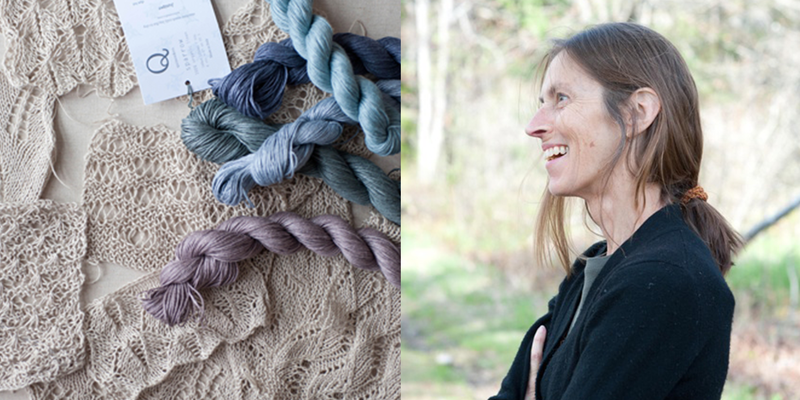 You can find Pam in her Coastal Maine home, making and designing, or in the mountains on a hike. You can find her company Quince and Co online at quinceandco.com and on Instagram @quinceandco. 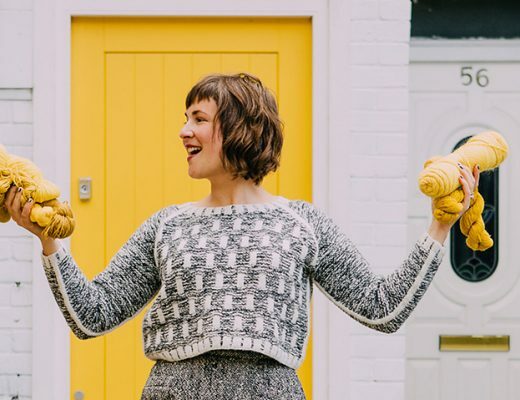 Sponsor: 6 Bits Storybooks, a digital quarterly publication for knitters who love to immerse themselves deeply in their knitting experience…from the mouths of story tellers: knitters, photographers, writers, designers, friends & nature. These storybooks incorporate designs, imagery, location, words, learning and tools to create an deeply engaging experience, taking readers on a journey. 6 Bits was created by two incredibly passionate and inspiring folks within this community, Melissa and Melody, and this past month they released the first issue Unearth of this beautiful digital editorial magazine, featuring articles from international knitters and dyers, where you hear the ‘whole’ story behind the designs and modeled in beautiful environment tied to the issues theme. Visit 6 Bits Storybooks at 6bitsstorybooks.com to subscribe to this stunning new publication and follow along on Instagram @6bitsstorybooks. And this past week 6 Bits launched their first Knit A Long, an opportunity to join in and knit a project from the first issue, Unearth. This time of year there are so many thing happening, our attention and time have many demands that may keep us from finishing projects, but don’t let that deter you from joining…embrace it as a starting point! So grab your issue of Unearth or find the patterns on Ravelry and start soon and simply be proud of what you do knit! Man on the street: For this week’s “Man on the Street” I asked the question, “Does your natural environment influence your fiber arts?”. We had some great answers from Abby @abbygoodknits, Carmen @theneedleseye, Hope @hopehawley, Shannon @whiskeyknitter_shannon, Sonja @atreebytheriver. Giveaway: The winner of last week’s giveaway is Tera, you’ve won a skein of Jill Draper’s yarn Rifton. Congratulations! This week’s giveaway’s are sponsored by Cream City Yarns and Loop London. 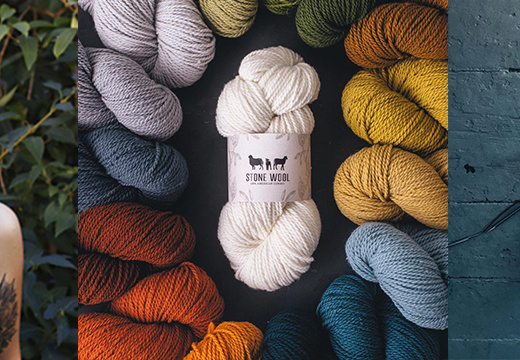 Cream City Yarns is giving away two skeins of Quince and Co Osprey yarn in Caspian and Loop London is giving away a copy of their newest book ’10’. To be one of the winners of this week’s giveaways, leave a comment on this blog post. Shop Update: It’s been awhile since I’ve given a Woolful Mercantile update, but being that Fall is upon us and I’ve got a few wonderful restocked and new things in the shop, I wanted to make sure and let you all know. If you’re on Instagram you may have seen the Sheep Breed calendar I announced. This is a special collaboration between artist Emily Fratson and myself, featuring 12 beautiful sheep breeds illustrated in watercolor, alongside 12 natural dye plants. 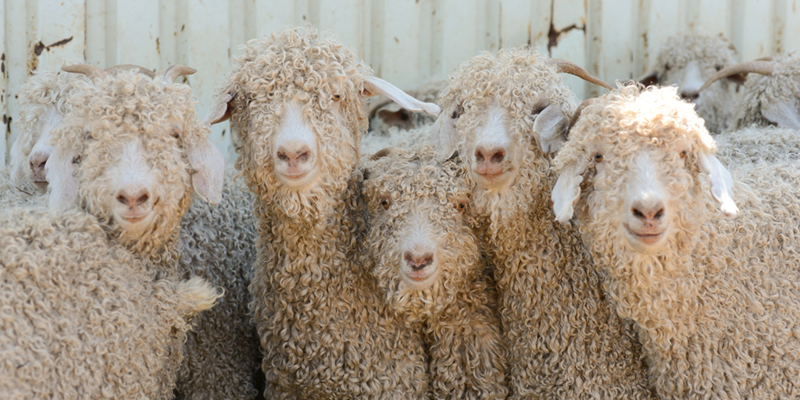 Each of these sheep were inspired by folks from the podcast or other fiber friends. 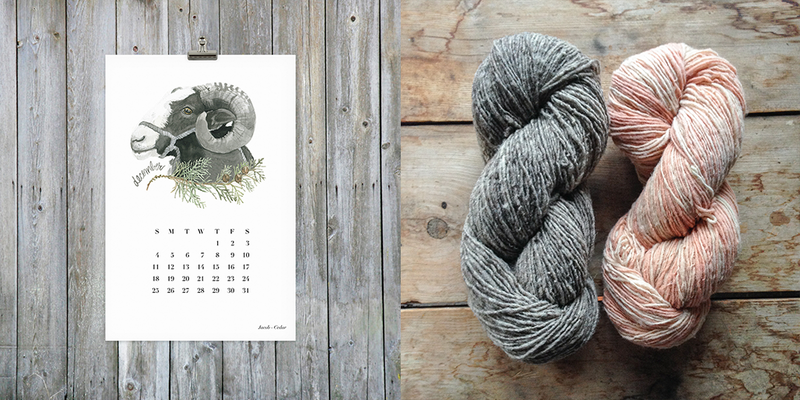 There’s only a few left in the shop, but soon there will be a handful of local yarn shops carrying the calendar as well, so stay tuned. As for yarns, I am most excited about the most recent batch of Moeke yarns, which includes two yarns that you’ll only be able to find in the Woolful shop…Heritage which is a blend of Moeke’s new Transylvanian Merino and black Elena wool AND a 100% Transylvanian Merino naturally dyed with Madder to create a beautiful coral variegated look. The founder and creator of Moeke yarns is the wonderful Ioana, which you can find more about in Ep 8. Visit woolfulmercantile.com to check out all these goodies. I can’t wait to see the patterns in the new Loop book! Loved this episode, so lovely. Thank you for bringing such great episodes to us!!! Loop is definitely in my list of yarn shops to hopefully visit! I’m so excited – Quince and Loop in the same episode! Love the calendar! It caught my eye when I was browsing in your mercantile last night. Both the prizes are lovely. Thank you for making that available to us. Cream city yarns used to be one of my LYS. I have never tried Quince yarns. I’ve also heard so much about Loop and would love to get the book as well. Thank you soo much for this podcast. I have binge listened to woolful and finally have caught up. I just love Quince & Co! Pam is so inspiring! Loop is such an inspiration! I loved visiting last time I was in London. I’m currently in the middle of a project using Osprey–so lovely to hear from the person behind the yarn! Just picked up my first skein of Quince & Co (Owl) and love it! Looking forward to listening to this episode. Love Quince and Co. yarns. can’t wait to have a listen to this episode – love pam allen’s work!!! I’m looking forward to this episode — I am knitting some baa-ble hats and a scarf with Quince & Co. yarns right now! This episode is great! Thanks! I’ve been patiently waiting to get my hands on that book – would love to win! Love this book! The patterns are great. I first listened to Pam from Knit.fm and when that ended, I found your podcast as it started gaining momentum. It is really fun to see these two podcasts come together in this interview. Pam’s Quince has really set the standard for quality American wool. I also really liked the answers in your Man on the street segment. Quince and Co. is a great brand. I really like the soft yarn they make! 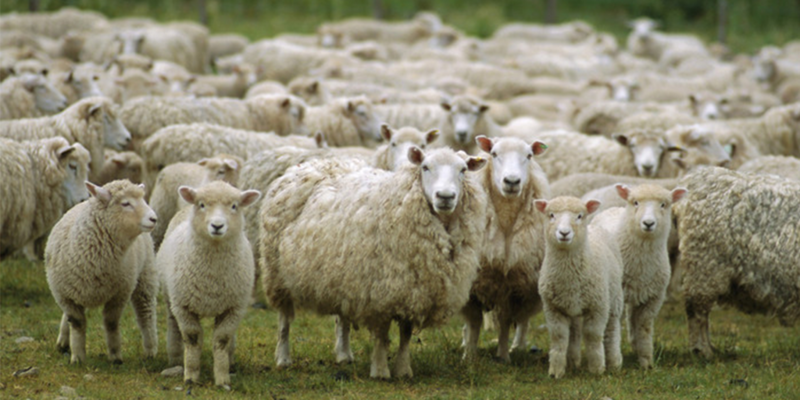 Thank you so much for taking the time to share all these wonderful wool full knowledge!!! Wow ! This week was a big one. Thanks so much again. newer listener but this episode really drew me in and made me a regular! As always, a very interesting podcast. Very much enjoyed. Pam Allen is one of my knitting heroes! Quince yarn colors are gorgeous. Oh, I’m looking forward to this episode! I love listening to Pam Allen’s voice! I love the line about her hands starting to itch. I am constantly using that phrase to describe myself. My hands itch to knit a lot! Pam Allen is one of my fiber heroes! It was a book & pattern of hers that was my first chosen knitting pattern project! And the Loop book sounds like a great way to celebrate my continued love of knitting! Thank you again for your very well done podcast! I can’t wait to read Loop’s book! Love Pam Allen. I learned so much from Knit FM and so enjoyed those podcasts. Thanks for a fun interview and for the giveaway. Thank you for the podcast. I love Quince yarns! Listening to Pam speak about her journey – making her love of knitting and craft into her life’s work – was inspiring. It also reminded me that so much of life is happy coincidence, making connections and taking calculated risks. When considering my own path in creating and making, it’s lovely to hear someone talk about simplicity, inspiration, and the connections that community and the history of the craft bring. Thank you for reminding me to reach out more, and to tap into my locality. Love Loop and Quince & Co. Thanks for these stories about them! This episode was very inspirational. Thank you for this podcast. Looking forward to more episodes. I loved this episode so much. Pam is such an inspiration. LOVE Quince and Co!!! What a great interview with Pam Allen. Thank you for the wonderful excursions you take us on along with you. It’s always lovely to hear from Pam Allen! She’s such an enjoyable and inspiring lady. I’ve been hoping for Pam Allen and Quince & Co to be featured on the podcast for a while now – such a great story and episode. Pam’s story was as much a history lesson in the knitting industry of the past few decades as much as it was about her own personal journey. Looking forward to knitting with some Quince and Co. Chickadee or Owl in the new year — would love the opportunity to try the Owl yarn a little sooner! I’d also love the Loop pattern book, as it features designs by some of my favourite knitwear designers. Lovely prizes both, and so appreciative of these opportunities to try new products! What a wonderful interview! I was so sad when Pam and Hannah stopped the knit.fm podcast. It was nice to hear her voice and her story. What a treasure. I am becoming addicted to your wonderful podcasts! Another great episode – thank you! Ah Quince and Co….such a trusty go-to. The first time I picked up Lark was my optimum yarn moment; it wasn’t just about hurrying to turn it into a sweater but genuinely appreciating the fiber. 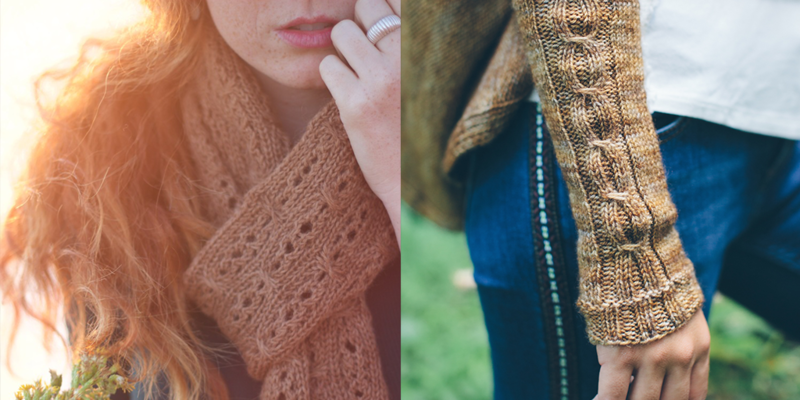 I certainly savored every moment of knitting an Afton scarf in Lark. 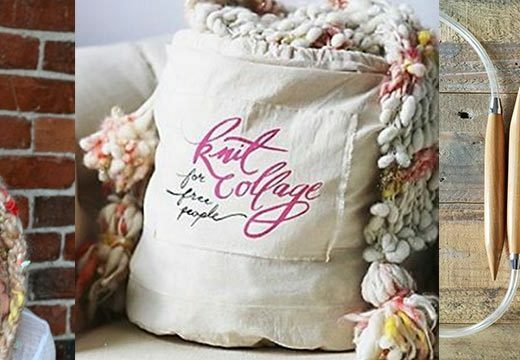 Pam Allen speaks so much to my knitters heart. I have not had much time as a mother of 3 [very busy] littles under 5 but I will be tuning in to knit.fm whenever possible now. Thank you for sharing your journey and heart Pam. what a journey Pam had before she started Quince & Co! another great woman behind a great brand! I really enjoyed help Pam emphasized getting to know all aspects of her work. I think she used the example of her son being a numbers man, turning into a real dedicated fiber enthusiast. I believe that helps transform a job into a passion. And mentioning knit.fm. I’m sad it’s not continued, but so happy to know about it! Thanks!! Looking forward to hearing next episode!! Always inspiring, thank you for sharing. I just loved listening to Pam’s journey! Thank you for sharing! I love it when a new interview comes out! Thanks for doing the podcast, I have learned so much! When I was in London for the first time, about a yer ago, I made a special pilgrimage to Loop. And then I went back the next day (this time without my husband). What a beautiful place! Thanks for this episode. I loved hearing about Pam Allen’s story! I love quince and co and pam’s designs! Looking forward to this listen. Great episode as always, so inspiring to hear Pam Allen talk. Loop book looks lovely! Thanks! I am knitting in the car listening to the podcast in between errands. Pam Allen just made a comment about the awesomeness and wonder of the yarn in the hands and I just stopped in awe and honor of this lovely thing that we do. Wknderful episode as always. As my interest in and understanding of knitting and yarn deepens all of the steps and bends and pauses and sprints from sheep to yarn to FO become so much more meaningful. Humble thanks. I misspelled my own name. Och. It was wonderful to hear about Pam Allen’s personal journey. I’m so obsessed with your podcast I eagerly await every episode!! 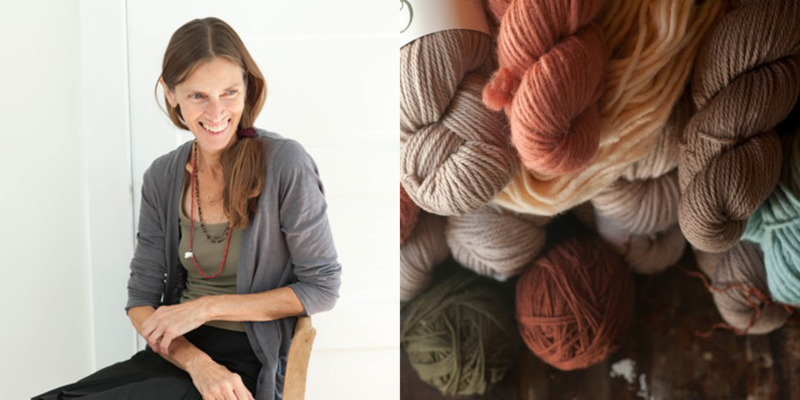 I really loved hearing Pam Allen’s story, I love Quince & Co yarn and it was so fun listening to the story behind it! Thank you so much for this podcast. I love listening on my commute and it goes by way too fast! Pam Allen’s story is so inspiring. I always look forward to hearing about new things from your podcast and can’t wait to check out Loop’s 10 book. I always love listening to Pam Allen talk about her journey. The first garment I ever finished knitting was one of her designs. Another great episode! It was especially timely as I just cast on a sweater by Pam Allen. More than anything, Ashley, I found your interview with Pam Allen to be inspiring. I loved hearing Pam talk about what she needs to feel comfortable and able to function – knitting, long walks, being alone . . . I often feel selfish when I take that time for myself, but I know that without those breaks, I would find it difficult to be productive and focused. Thank you for your wonderful interview. I’ve just recently discovered your podcast and what a treat to hear Pam Allen on the first one I chose! I’m currently working with her Owl and Osprey yarns. This interview is really a great inspiring one ! …love what Pam Allen said about how in choosing this way of local work, we all sustain a way of live in farming , small human industries, knowledge, community and our landscape , and those landscape will feed us and give us calm and confidence. Great one, thanks a lot! Incredibly fascinating journey. Loved lIstening to Pam talk about her love of Maine and her love of trying to save the industry. Thank you for another amazing podcast Ashley. Pam Allen is so inspiring! Cream City Yarn is such a great shop! I go by when I’m in the Milwaukee area whenever I can. Loved this episode – thank you! Thanks for the inspiring interview! I recently visited Maine and fell in love. It’s a knitter and nature lover’s dream. Thank you so much for interviewing Pam Allen! She’s such an inspiration!!! This was my favorite episode of all. Wonderful. Thank you so much for the giveaway as well. Pam is a capital-L Legend!! Great episode. I just started a sweater using Quince &Co Owl and it was fascinating to hear the story of how the company began. I enjoyed this interview so much. I could listen to Pam talk knitting for hours. I miss listening to both her & Hannah on knit.fm She is such an inspiration and a wealth of knowledge. Great interview!! Loved hearing Pam Allen’s story. Thanks! Love Pam’s approach to her business and the thoughtfulness she puts into her products. Look forward to using more Quince and Co yarns. I’ve been purchasing Quince yarn and am glad to have the background info Pam provided. What an interesting story behind Quince & Co ! I love hearing the stories and Pam’s was great ! 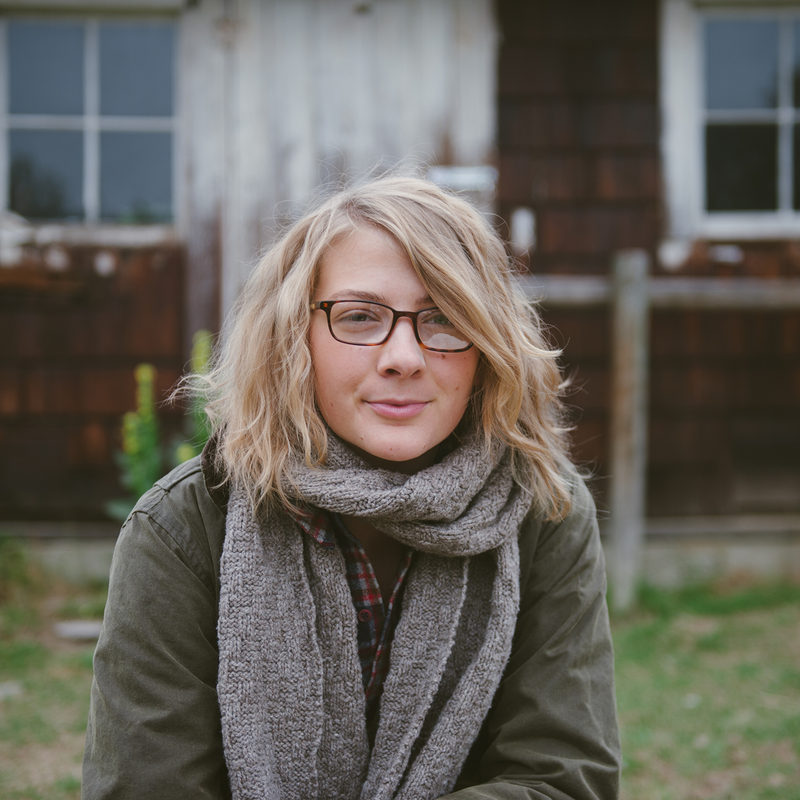 Hannah Fettig described Pam Allen as a treasure. This description is so apt — Pam Allen’s soothing voice and epic knowledge base are incredibly valuable. I’m sympathetic to Pam Allen’s introverted personality so I understand her need for solitude, but I do hope she will continue to do the occasional interview or class. Thank you for interviewing Pam Allen. I ❤️ Wooful & I loved this episode! I especially loved Pam’s thoughts on sheep & the countryside. 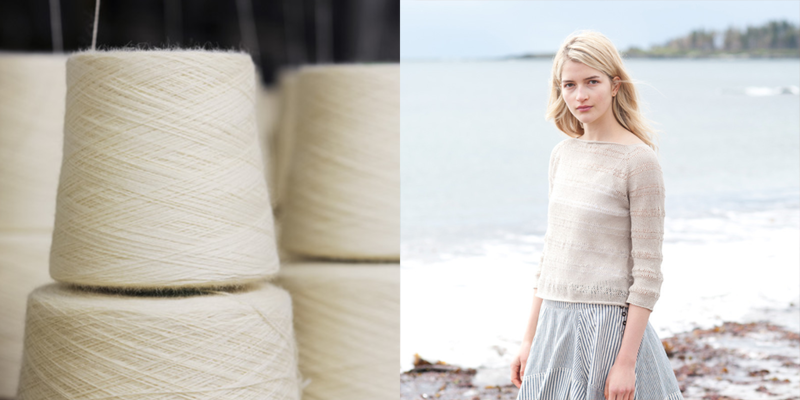 I’m dreaming of knitting with Quince & Co. yarn & of going to Loops in London – so either prize would be awesome to win! I really loved this episode. I’ve heard a bit about Pam’s story before and the development of Quince & Co but this was more in depth and great to hear from her. I secured some Sparrow for myself and can’t wait to knit with it. 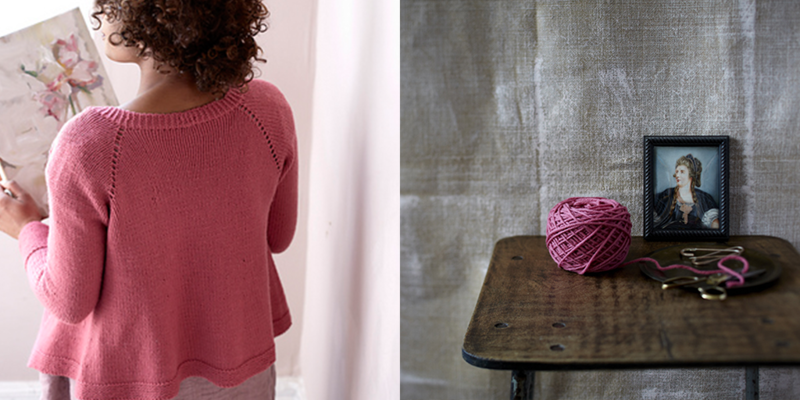 I’ve been wanting some Osprey to try – Amy Herzog has some beautiful sweaters in her Knit to Flatter book in Osprey. Thank you for a wonderful podcast. So enjoyed this episode and the story of Pam’s journey. Have followed Quince and knit several patterns. Love the simplicity of the designs. Thank you Ashley and Pam for such a wonderful episode. I love the Pam’s simple designs and it was so interesting to hear more about them. Thank you for this very interesting episode with Pam Allen. Love her designs and yarns from Quince. Loved this episode so much. Also, I’m so excited for the watercolor calendars! Wonderful episode! I’m so looking forward to trying Quince with a few new patterns I have in mind. It’s been a very busy fall. I finally got to catch up on the last three podcasts. Last night climbing in bed early with a new hat pattern and finishing up early this morning with tea, a fire and the pouring rain. Just lovely to hear Pam Allen’s voice and all three intriguing stories. I so enjoy hearing these bits of real peoples stories woven through and around their fiber journey. Quince is perhaps my favorite yarn and it was fascinating hearing Pam’s story! A fabulous interview! I love the way you gently guide your guests through their fiber stories. Pam Allen’s designs have always drawn me in; I had no idea what an amazing individual she is. Thank you for bringing her story to us. What a wonderful podcast. Thank you, Pam, for sharing your story with us. You are in inspiration. Ashley, your podcast has become my favorite! Great podcast. I was a fan of the Knit FM podcast by Pal and Hannah as well! Pam has a very interesting journey! Love Quince & Co, what a great episode! What a great episode. I’ve been growing more and more into Quince yarns and it was great hearing their story. I’d be so happy if I won this giveaway. I think I’d cry a little. Just kidding, but I’d be super stoked. xo. First time listener to your podcast- really enjoyed it! Looking forward to back issues. I just loved reading and listening to your latest episode. Thank you. I just love everything Pam Allen does! Quince and company is one of my favorites! It’s always a good day to hear Pam Allen tell her story! This episode and Pam Allen give me hope for the future of knitting in America and in my own life! Thanks for the inspiration! Love Pam Allen and Q&Co! Great interview! Loved hearing more from Pam Allen. 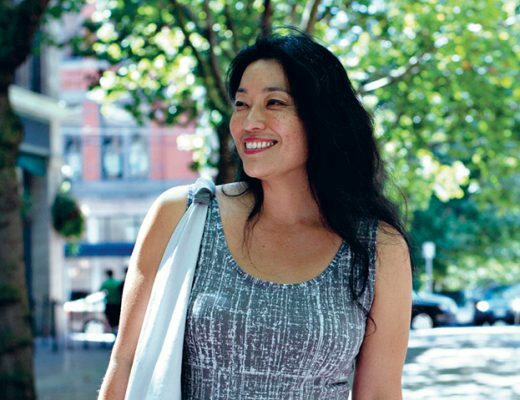 Her story is inspiring and her love of the craft of knitting is so clear. Thanks! Loved this episode! I miss Pam’s knit.fm podcast. Fantastic giveaway- love Quince & Co yarn. Have been an admirer of Loop from a distance. Thanks for the chance to win. I’m dying to go visit Loop in London one day! The book would be the next best thing. Love your podcast so much and love Quince & Co. yarn. Happy knitting! My friend cancelled our usual Monday date today, so instead of working on class stuff, I’m listening to the podcast. Thanks! Thanks for a wonderful podcast. I looooved this episode. Pam Allen’s work is gorgeous and I love Quince & Co (both because of their values, beautiful products, and the fact that they’re based in my home state of Maine), so I was super excited to see this episode. Excellent work! Pam Allen is a huge inspiration and I thoroughly enjoyed this episode. Great episode, as usual. Fingers crossed for the Loop 10 book!!!! I have not tried Quince & Co yarn yet but I look forward to casting something on. I don’t know when I’ve enjoyed a podcast more! I have been admirer of Pam Allen since her first Editor’s Letter in Interweave. I subscribed to the magazine just to read her missive each edition. When I discovered Quince and CO. I placed an order immediately. However, I had never know of her background and what brought her to the present and for that reason I thank you for this podcast. It is always so interesting to ‘meet’ the real people behind the art we so love and your work makes that possible. I will light a candle, brew some tea and snuggle up with my knitting for the next addition, looking forward to it! Such a great and inspiring episode. Pam Allen is a hero of mine now! Thanks for this interview. I have long admired Pam, and the quinceandco yarns. Very inspiring! I was so excited to learn more about Quince and Co! Great interview- thanks so much! Loved listening to Pam Allen ‘ s knitting journey, as well as Quince & Co. jounrey. Wonderdul episode. Thank you Ashley. I found this episode especially touching. I have gone through so many things dealing with motherhood and loss and trying to find my place in this community. Thank you. Dottie Angel really is one amazing artist. Loved the podcast, so inspiring! Thanks for bringing us such wonderful stories to listen to while we knit!